United States Treasury names IRGC units involved in ballistic missile program to its sanctions blacklist. 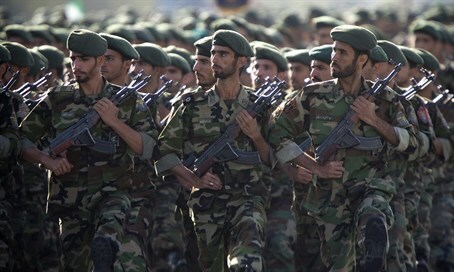 The United States Treasury on Thursday named units from Iran's Islamic Revolutionary Guard Corps (IRGC) involved in the country's ballistic missile program to its sanctions blacklist, AFP reported. The move comes two weeks after the country ran missile tests that Washington labeled "provocative and destabilizing." The Treasury specifically placed sanctions on Shahid Nuri Industries and Shahid Movahed Industries, both units of the Shahid Hemmat Industrial Group responsible for Iran's liquid-fueled ballistic missile program. It also sanctioned the Al-Ghadir Missile Command of the IRGC, which it said appears to have operational control of the country's ballistic missiles. The Iranian regime earlier this month fired a number of ballistic missiles in tests across the country. The words “annihilate Israel” were reportedly written on the missiles, and Iranian officials claimed the missile systems being developed were needed “to confront the Zionist entity” and to ensure “its collapse”. "Iran's ballistic missile program and its support for terrorism pose a continuing threat to the region, to the United States, and to our partners worldwide," said Adam Szubin, Treasury Acting Under Secretary for Terrorism and Financial Intelligence, according to AFP. "We will continue to use all of our tools to counteract Iran's ballistic missile program and support for terrorism, including through sanctions," he added. The sanctions freeze any assets of the listed entity under American jurisdiction and ban any business with them by American companies or individuals. In addition, the Treasury blacklisted British businessmen Jeffrey John James Ashfield and John Edward Meadows and companies linked to them for their attempts to sell aircraft and parts to already blacklisted Mahan Air, which is closely tied to the IRGC. Mahan Air "continues to support the Iranian government's destabilizing actions in the region by conducting flights to Syria in order to transport fighters," the Treasury said. In January, the United States imposed sanctions on Iranian companies and individuals in response to a previous round of tests. The European Union (EU) is also reportedly considering sanctions on Iran in response to the tests, which are a violation of UN Security Council resolutions, even though the Islamic Republic denies this.